All that stashed yarn won’t knit itself, you know? Unless you’re Molly Weasley. She has no idea just how easy she has it! Speaking of which, I started re-reading Deathly Hallows today. It’s so much better this time around. Everything is clearer and the story is much dearer to me now. I hope I finish this before the films come out. 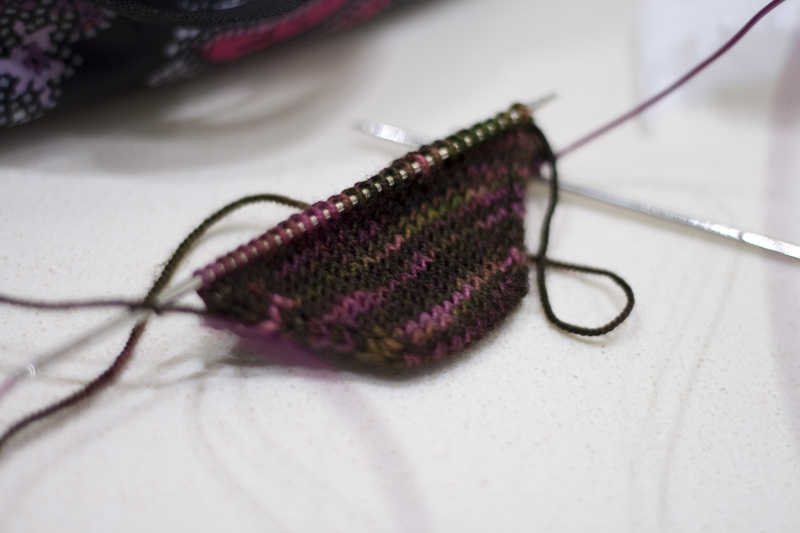 The second Charybdis sock has a toe. Yay! I wanted to get this done asap but then I realized the Socks That Rawk KAL lasts for 3 months, so why am I rushing? 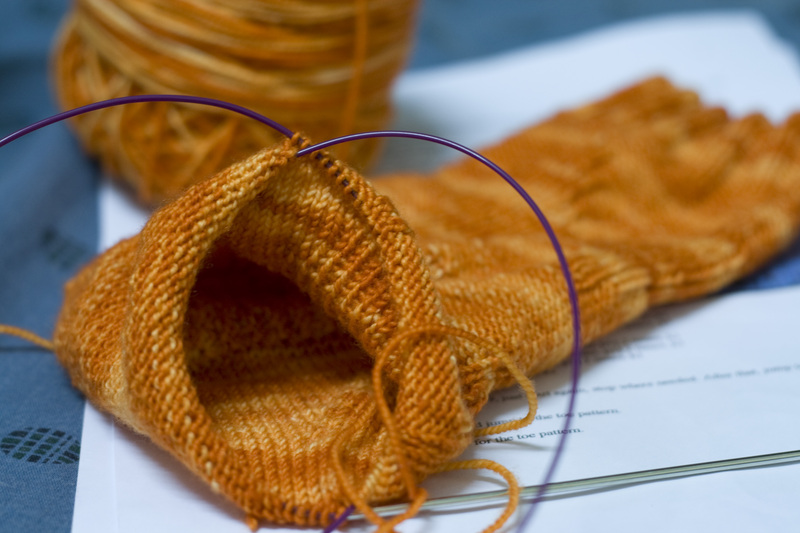 I do have a second pair of socks to knit for the KAL, but that should be a breeze since it’s an Irishgirlieknits pattern. More knitting happening after the jump. 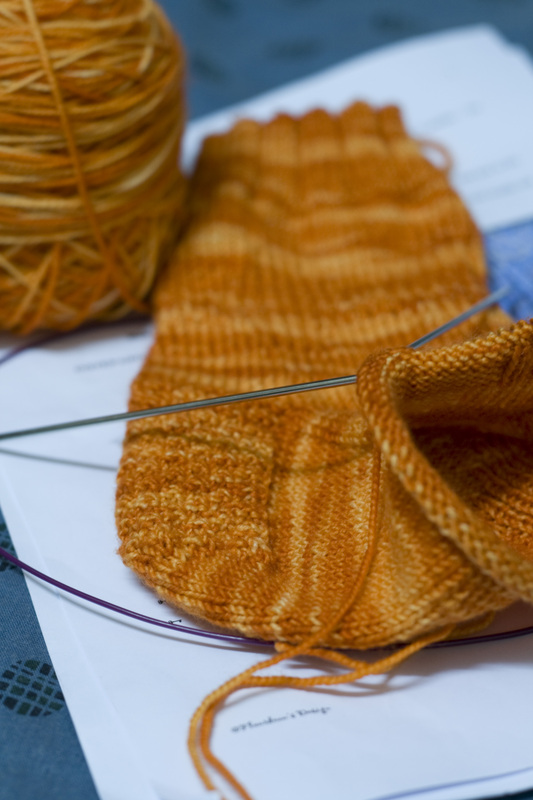 The test knit socks for my friend Caroline got it’s well-deserved attention last Friday. The wee bit of cuff and leg of the first sock grew into so much more: it now has a full leg, heel flap, gusset and the beginnings of a foot! Sorry about the eye-burning colour – it is really bright huh? 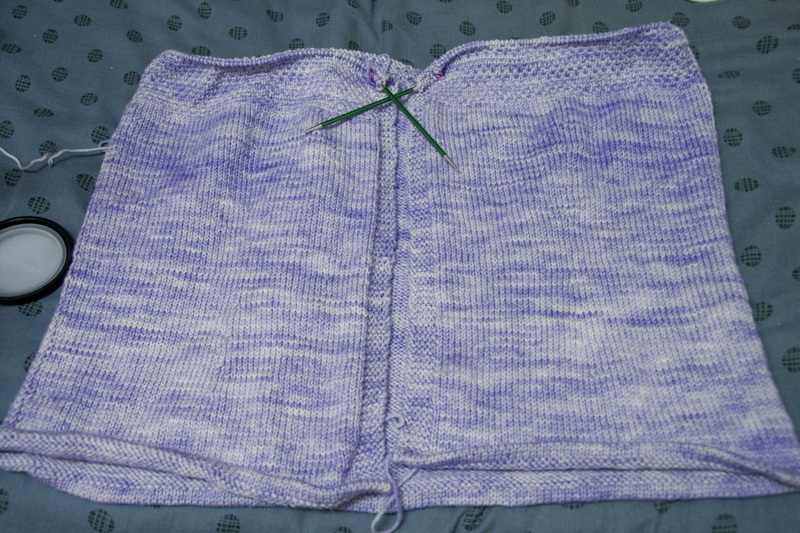 These socks are supposed to be reversible and this is the purl-side out. 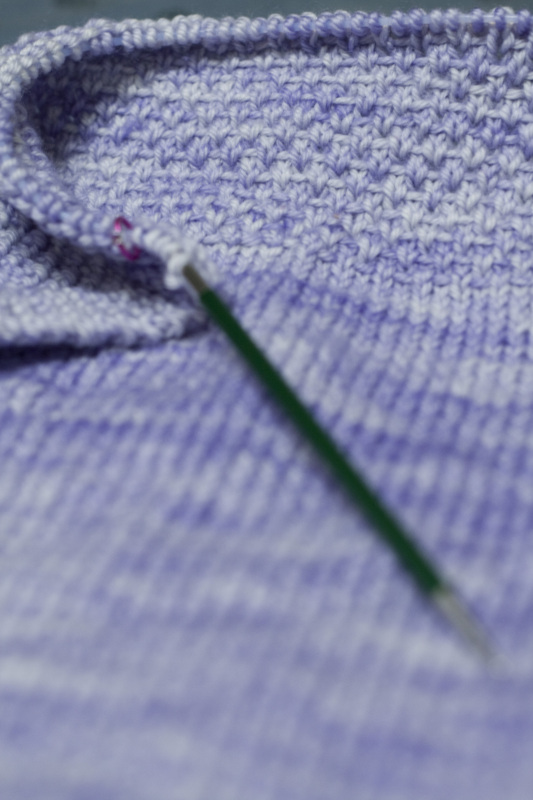 This is the knit-side out. You don’t see it much but it is the knit side, trust me. I loved knitting this. Next time I pick it up again I think I will use the charts since following lines of instruction is never my strong point, esp if I am trying to watch Stefan and Damon Salvatore go angsty gorgeous at the same time! Why, yes I have been sucked into (pardon the pun!) The Vampire Diaries, thanks to Eibee and her friend Ella. For the past few days, I have been working exclusively on the Austin Hoodie. The miles and miles of stockinette is over; I am now about to complete the woven band and then on to separating for the back and fronts. Yay! The Tosh DK skeins are a bit mismatched. Two of the skeins are much brighter so I set them aside and will probably use for something else. I just hope I have enough to do the rest of the hoodie. Should I have alternated? The colour is variegated enough anyway, right? The woven band/linen stitch is not so boring as with the socks I did before. The larger needle helps of course. My Signature Needle circs are wonderful beyond words, but the cable’s memory is a bit too much for my liking. It is flexible enough but it does curl a bit and gets in the way of my knitting esp at the start and end of rows. Nothing I can’t handle though but I wish they would use thinner cables in the next round. Now for some yarn candy. My Lotus Knits Pin-up Club is still growing strong. 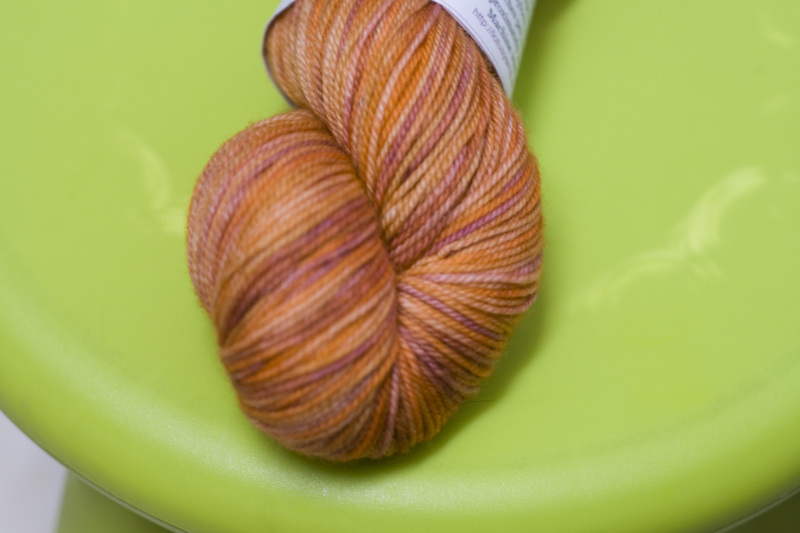 This latest instalment is a nice orangey pink colourway inspired by Lena Horne. I am not sure what to do with this yet, or the previous shipments but it’s MCN. And you know how much of an MCN whore I have become lately. I guess I have enough MCN in my stash in various colourways to do a nice Daybreak shawl. What do you think? 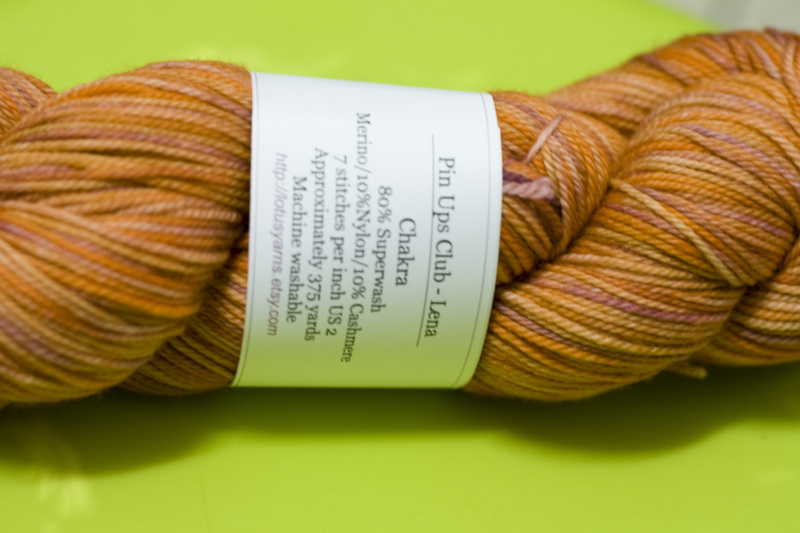 Will this skein look good …. 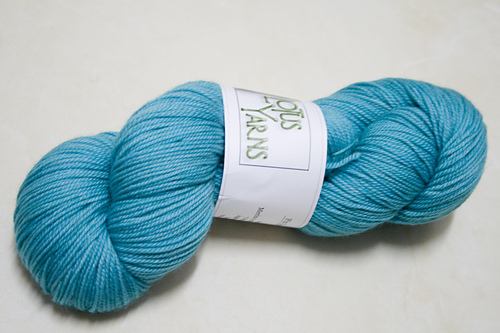 … combined with this skein? Let me know what you think. You know what, I will make a contest out of this. Yeah, let’s do a blog contest! Leave a comment with your suggested colour combination, as long as the Lena skein is one of them, and I will let the random number generator choose a winner. 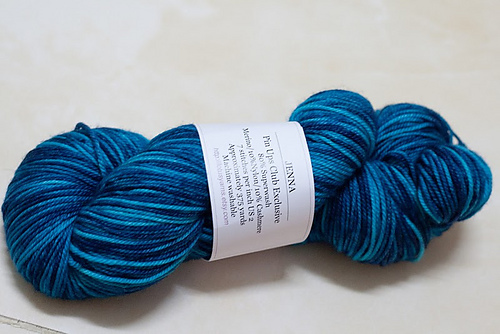 I will use the winner’s suggested colour combo to knit my Daybreak shawl. To make it worth your while, the winner will receive a skein of Dubai Knits Faith, Hope and Love yarn. How’s that? Taking suggestions until Sunday, 1st August, 9pm GMT+4. I think the light blue with the golden colors will look wonderful together. I can’t wait to see it finished! I think that Lena and the first blue will look rockin’ good together!!! The shades are all in the blue family and paired with the orangey pink, it should be quite amazing. I have to say, I like the top two skeins together, the both orange/yellow ones, I think would match well and look different at the same time. I think either one would look great, but my favorite would be the Jayne. I think together with Lena those colors would really pop! Can’t wait to see the finished product. I want to reread Deathly Hollows again. I read it the night it came out, and stayed up all night reading it, so, you know, I probably don’t remember half of it! Love the new yarns! I love both blues, but maybe the top one would have a bit more pop!